Chasing Instagram fame and food trends has led chefs down some interesting paths — and sometimes, they got lost on the way. 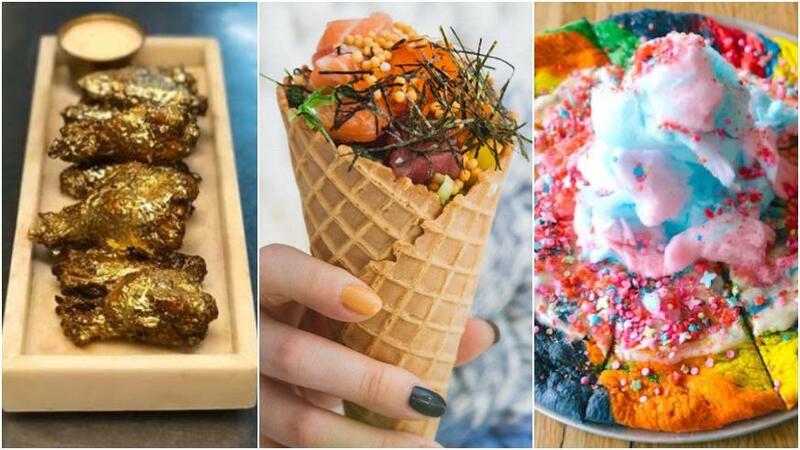 These food experiments went too far on the path to Instagram fame. Pleading for sanity in the food world is pointless when restaurants live and die not necessarily by how good their food is, but how Instagram-worthy. Which isn’t necessarily a bad thing! The garnish race happening on the Bloody Mary scene has been amusing to watch (and a boon for brunchers). And keep stacking those milkshakes until you reach the moon, Black Tap. Trends rule the culinary world but, like Icarus flying too close to the sun, sometimes chefs are burned by their own ambition while reaching for viral glory. We rounded up a few creations that didn't quite hit the culinary mark. While garnishing food with gold flakes didn’t start with social media, it certainly helped the idea spread beyond Goldschlager. But why stop at flakes when your entire dish could be covered in gold? Instagram star Jonathan Cheban (@foodgod) got New York’s upscale sports lounge The Ainsworth to create the Golden Wings, marinated in coconut butter, chipotle and honey for 24 hours then tossed with real gold flakes and served with bleu cheese dip, available starting this month. So if you’ve ever wanted to pose like a Gold Rush prospector biting into a nugget to see if it’s the real deal, then end up with gold smeared all over your lips like you’d just made out with a spray-painted performer in Times Square, then wings start at $30 for 10 at The Ainsworth’s East Village (64 Third Ave.) and Chelsea (122 W. 26th St.) locations. Ice cream is already a perfect summer food. So is poke, the raw Hawaiian fish bowls that took the mainland by storm in the dead of Winter 2016. But Pokee in Greenwich Village went a step too far with its new menu item. 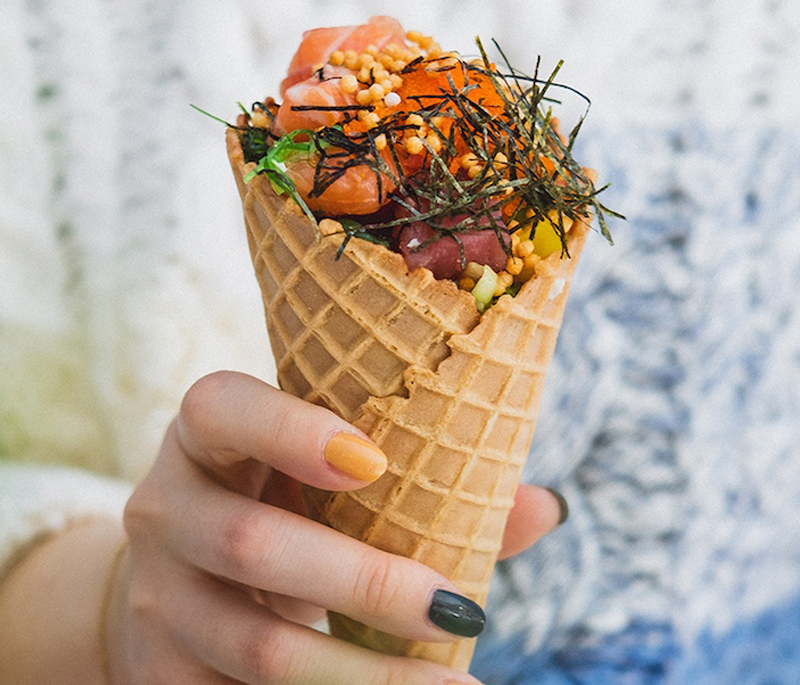 The Poke Cone ($8.95) is “an alternative to ice cream in hot weather,” and let’s just stop right there and agree that nobody has ever considered raw fish and ice cream interchangeable. The waffle cone’s sweetness matches their sauces, a rep assures us. If you can get past all that, there’s the issue of how to eat it, and getting to the glop of rice at the bottom is not something to look forward to. We all want to be healthier, but drinking your nutrition is a feature of late-stage capitalism that appears to be distinctly American. The streets of Europe do not teem with green shakes for the performative wellness crowd, while Soylent is trying very hard to condition us into accepting liquid nutrition without any commitment to taste, but we deserve better. Unfortunately, the Hummus Shake at Hummus & Pita Co. is not it. 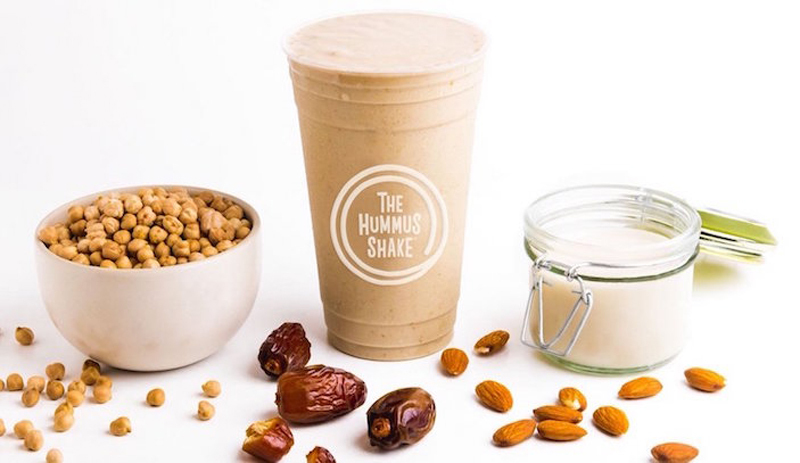 Despite its name, the Hummus Milkshake does not contain the savory spread made with lemon, olive oil and garlic, though that doesn’t stop your brain recoiling in confusion. In addition to the beans, the milkshakes are made tahini, bananas, dates, almond milk, vanilla and cinnamon, and come in strawberry, chocolate, pistachio and butter pecan flavors. Alas, none of that masks the chalky texture and chickpea aftertaste you don’t crave. When did we start aspiring to eat like mythical creatures? Of course, any real creature could eat something like the pizza named Pop Candy Land at Manhattan’s Industry Kitchen and not go into a diabetic coma. At least their dreams would be trippy? This $18 creation lurks only on the brunch menu, casually tucked among the legit wood-fired pies despite desserts having their own section. 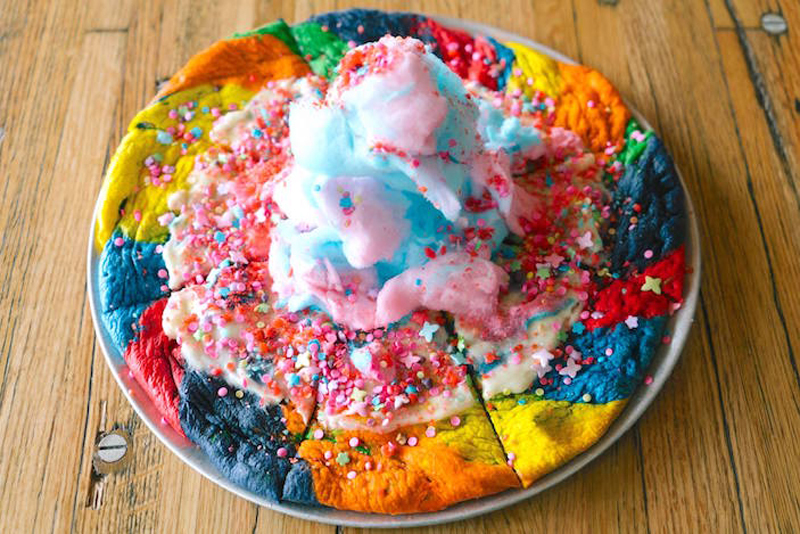 Combining the trends of pizza and rainbow-colored unicorn food, the Pop Candy Land has a sweet rainbow crust, topped with cream cheese frosting, Pop Rocks and a dollop of cotton candy. Even a My Little Pony would question calling that pizza. There hasn’t been a food trend that better captures the Instagram-driven food era than the Raindrop Cake. 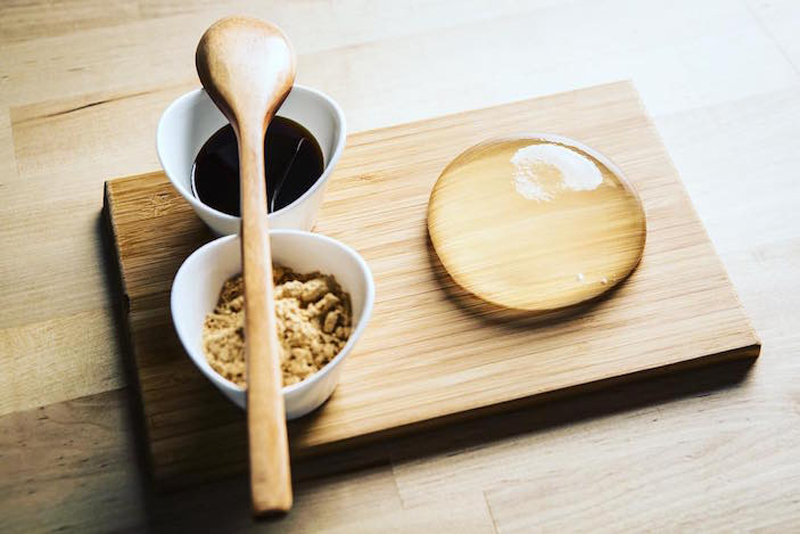 An instant sensation when it debuted at Brooklyn's outdoor market Smorgasburg in 2016, the Raindrop Cake looks like a fat drop of water that through the power of agar (gelatin) keeps from dissolving back into its liquid state. It defies gravity, looks like something woodland creatures like fairies and fawns would eat (drink?) and tastes… like nothing at all. Never has food with so little substance achieved so much Instagram glory.